SRWare Iron is a web browser that is based on the Open Source Chromium web browser. It offers the same fast performance and rendering abilities as the Chrome browser, but without the security and privacy issues that prevent some users from installing and using the Google Chrome web browser. The developers of Iron have created a privacy and feature comparison that highlights privacy issues identified in Chrome and how SRWare Iron handles those issues. Chrome features like the installation ID, error reporting or suggest do not exist in the Iron web browser. Another feature that is not used is Google Updater, which is a system process that checks for updates periodically. A missing auto-update functionality on the other hand means that users need to monitor the web page of the project for information about new versions that are released by the developers. New versions often introduce privacy or security fixes to the browser which highlights that it is essential to update the browser as quickly as possible. 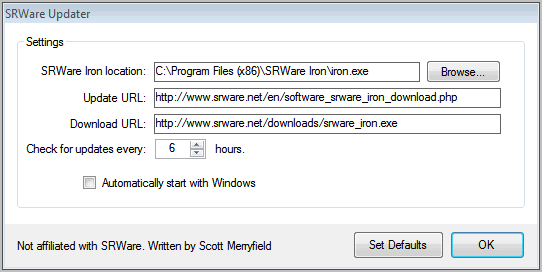 The third party application SRWare Iron Auto-Updater for Windows adds the automatic update functionality to Iron. The program is however more versatile than Google Update. When you start the portable software for the first time you will see a screenshot that looks like the following. The program tries to locate the Iron path on the local hard drive automatically. You can click on the Browse button if it is has not been identified correctly, or if you are running multiple versions of the browser on your system. The update and download url should remain untouched. They both point to the official project website. The update check interval has been set to six hours, which some users may want to reduce to make sure they update the browser as soon as an update is released by SRWare. The automatically start with Windows box can be checked to autostart the updater with the operating system. You can download SRWare Iron Auto-Updater from Softpedia. The software is fully compatible with all recent 32-bit and 64-bit editions of the Windows operating system. Thanks Martin for this info, I use Portable version of SRWare Iron, can I use this auto-updater too? It might work, not sure though. I think this software is not usefull at all, Why ? Because SrWare Iron Browser is not update regularly like Google Chrome, it still stuck at version 12.0.750.0 from Jun 28, 2011. On the contrary, a new version just popped up today. But you do have a point; iron updates come out once in a blue moon, rendering this software less useful. Jyo,where is that update?? I do not see it at the SRWare site….Huh, found a new version at CNET. where is iron auto updater? Please tell me the URL.